Update: The house was sold for $420,000 on September 12, 2018. There are grand, beautiful houses that have been sold three or four times in the past 20 years. This kind of turnover typically says nothing about the house; we just live in a restless time. That’s especially true for the upwardly mobile types who can afford to pay, say, $400,000, $500,000 or more for a house. People who are in a position to make big money tend to go where it leads them. And then there are houses like 1820 Madison Avenue. It went up for sale this week for the first time in 43 years. It’s easy to see why the owner has lived there so long. Sunset Hills is one of Greensboro’s most attractive neighborhoods, and this house is a fine example of why. Built in 1925, there’s nothing gaudy or breathtaking about it. It’s elegantly, timelessly straightforward. The house is a spacious but not exorbitant 2,700 square feet; at $475,000, the price comes to $176 per square foot. That’s toward the upper end of the range for Sunset Hills, and why not? Four bedrooms, three bathrooms, beautifully landscaped. Lots of natural light from a sunroom and a screened porch. The closest thing to a flaw is the kitchen cabinets, which look a bit dated, ’80s-ish, perhaps. The location is a block north of West Market Street at Madison and North Tremont. In the past year and a half, there have been at least six Sunset Hills homes that have been sold for the first time in 35 years or more. One had last been sold in 1946. If you can afford to get into the neighborhood, it can be a hard place to leave. BB&T has bought Edgewood, the mansion and 2.26-acre property at 111 Arden Place. It paid $770,000 in an auction at the Guilford County Courthouse on Tuesday. Their plans for the property are unknown; their representative at the auction works for a law firm and didn’t know. I’ve asked the bank and hope to hear back soon. Sunset Hills neighbors have said online that they believe restoring the house and property would require an immense investment beyond the purchase price. One neighbor expressed the opinion that the swimming pool is too deteriorated to be saved. In any case, it seems unlikely that BB&T will do anything other than sell Edgewood again. BB&T first became involved with the property nine years ago. According to the latest deed on the property, BB&T Collateral Services provided a loan to the owners in July 2008. In 2015, it sold the debt to SummitBridge National Investments IV of New York. SummitBridge foreclosed on the property and then bought it in February 2017. It paid $175,000. And now it has sold it to BB&T for $770,000. If anyone can make sense of all that, please leave a comment below. On Wednesday, the bidding started at $460,765 and shot up quickly from there. Another bidder, an individual who wanted to renovate the house and either live there or sell it, stayed with BB&T as far as he could go but had to stop at $750,000. An unusually large crowd of about 25 people attended the auction. Under North Carolina law, the sale remains open for 10 days to allow upset bids to be placed with the Clerk of Superior Court. Such bids must be at least five percent higher than the winning bid. In this case, that would total $808,500. An upset bid would trigger another 10-day upset period, allowing the auction to continue in slow motion. Contrary to some neighbors’ expectations, a buyer who wants to redevelop the property wouldn’t necessarily need to get it rezoned. Its old RS-9 zoning is reclassified as R-5 in the new Land Development Ordinance. That zoning allows up to five single-family units per acre; in this case, that would mean theoretically up to 11 homes. The actual number allowed might well be less because any subdivision of the property would have to meet city requirements on minimum lot size and street frontage (and possibly more; those were two points mentioned by zoning director Mike Kirkman when I asked him about it today). The view from the street offers just a glimpse of the G. Simpson Boren House, aka the Thomas Shaw House, aka Edgewood. Note, January 11, 2018: This post has been revised with comments and an additional photo from Benjamin Briggs, executive director of Preservation Greensboro. When you look at auction.com, you can expect most of the listings to be foreclosed subdivision homes, condos and townhouses. Pretty mundane places. The last thing you might expect would be a house like 111 Arden Place, a 5,200 square-foot stone mansion on 2.26 acres in Sunset Hills. The tax value of the property is just over $1 million. In 1999, the last time it was sold before foreclosure last year, the price was $845,000. This could be an interesting auction. Known variously as the Thomas J. Shaw House, the G. Simpson Boren House and Edgewood, it may be the largest stone residence in the city, according to Greensboro: An Architectural Record. It has six bedrooms and four bathrooms. The property includes a swimming pool, garage, gated driveway and many trees. The online listing includes no interior photos, and if there are any elsewhere online, they’re well hidden. So, here’s a million-dollar house (per the county tax department), and the winning bidder can go inside and see its condition right after closing. OK, then! Bring a certified check for 5 percent of your winning bid and hope for the best. Note: Online listings show the house as 5,693 square feet; the county property record shows 5,209. One next-door neighbor is the First Church of Christ, Scientist. Update: The house sold for its asking price, $429,900, on August 30, 2017. It had been for sale for seven days when the owners accepted the offer. Owners of classic homes in Lindley Park, Sunset Hills and Westerwood are getting the message that this is a good year to sell their homes. Five have gone up for sale in the three neighborhoods this month, and there have been 11 closings since June 1. Fast deals are common. Offers were accepted in a week or less on five houses currently under contract. One of the latest to come onto the market is 1907 Madison Avenue in Sunset Hills, a distinctive 1928 brick bungalow. The exterior features arched brickwork over the windows and a low brick wall around a front patio. It’s roomier than it may look from the street — 3,118 square feet with five bedrooms and three full bathrooms. It sits on a quarter-acre lot that easily accommodates the detached two-car garage. The listing price is $429,900, $139 per square foot. That’s right on target for an immaculate home in one of Greensboro’s most popular older neighborhoods. 1907 Madison’s owners have had the house since 1974 (four of the classic homes now for sale in the neighborhoods haven’t been sold since the ’70s). 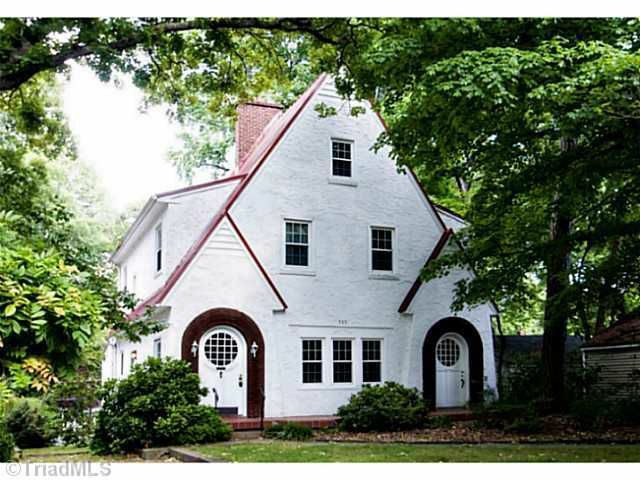 It’s one of the most elegant classic homes you’ll find in Greensboro.